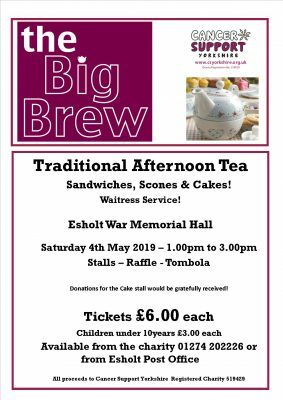 Join us for a 'Big Brew' Traditional Afternoon Tea! Linda Enderby and Friends invite you all to attend their annual event in aid of Cancer Support Yorkshire. Traditional tea includes, sandwiches, cakes scones and unlimited tea and coffee - Waitress Service! The venue is the lovely War Memorial Hall in Esholt Village (former filming location of Emmerdale).